As humanity finds ways to mitigate climate change, we also need to learn how to live with its impacts. The Sabin Center looks for ways that existing laws and regulations can be used to prompt short- and longer-term adaptation efforts at all levels of government and by private actors as well. Where existing authorities push in the wrong direction or fall short of what is needed, the Sabin Center argues for legislative and regulatory changes. The Sabin Center partnered with the Natural Resources Defense Council to research and develop climate-smart reforms to the National Flood Insurance Program (NFIP) that can help the program better weather a changing climate, lessen the taxpayer burden, and increase the safety of homeowners. This project has produced an article summarizing a set of suggested reforms. A joint white paper provides a deeper dive into specific standards for rebuilding and improvement that can be promoted at the local and state level. Additionally, an interactive map provides information on the adequacy of state real estate policies to disclose flood risk to future home buyers. Further commentary on the map is available on the Sabin Center blog. The Sabin Center partnered with Dewberry, a consulting firm that specializes in land use planning, to develop adaptation strategic plans for three Florida communities—including St. Augustine—with support from Florida’s Department of Economic Opportunity. The strategic plans identify key vulnerabilities and explore possible responses for each community. Florida Department of Environmental Protection included the St. Augustine adaptation plan as an appendix to their coastal adaptation guidebook. St. Augustine has also posted the St. Augustine adaptation plan on their website. The Sabin Center worked with the UN Development Programme and the International Federation of the Red Cross (IFRC) to advise the Laotian government on the development of an integrated disaster management and climate change adaptation law. Executive Director Michael Burger’s commentary on the project is available on our blog. See also: Presentation, Integrating Disaster Risk Management and Climate Change in Lao PDR (Michael Burger, July 2015). In the aftermath of Superstorm Sandy, which struck in November 2012, the Sabin Center spearheaded an effort to overhaul New York City’s electricity, gas, and steam distribution grids so that they would be better adapted to a changed and changing climate. That effort yielded a settlement with Consolidated Edison (Con Edison), approved by the New York Public Service Commission in February 2014, and a multi-billion-dollar adaptation plan. The Sabin Center is now engaged in an ongoing effort to ensure that Con Edison fulfills its obligations under that settlement. 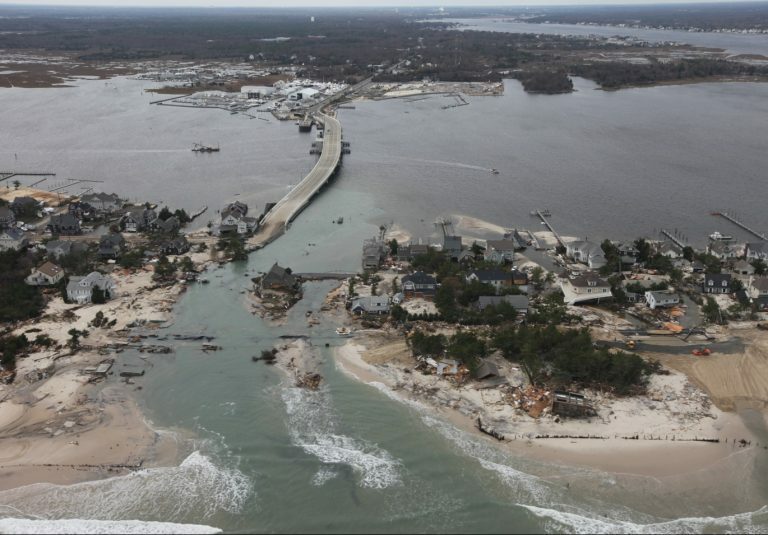 The Sabin Center frequently submits comments on the environmental review documents for coastal infrastructure and other proposals that may be vulnerable to the effects of climate change, outlining the ways in which climate change will affect the proposal and encouraging decision-makers to account for these effects. In September 2014, New York enacted the Community Risk and Resiliency Act which requires in part that the New York Department of State and the Department of Environmental Conservation create model local laws relating to climate change adaptation for use by local governments. The Sabin Center for Climate Change Law has assembled existing and suggested local law provisions that reflect diverse approaches to adaptation to climate-enhanced flood risk in an effort to: assist the State with drafting model local laws for adaptation; encourage the State to incorporate a broad range of adaptation strategies, including retreat from areas of high flood risk; and assist local governments with implementation of these programs. While many of the approaches reflected in this paper deal with coastal local laws, local governments could adopt similar strategies and language in riverine floodplains. The Sabin Center has developed model protocols describing how decision-makers can account for the impacts of climate change when conducting environmental reviews and related planning activities (such as resource assessments). These protocols are intended to provide guidance to federal, state, and local agencies, environmental consultants, and other stakeholders who are involved in planning and environmental review processes. By cataloging potential tools and illustrating through case studies the practical situations in which managed retreat has been used, this handbook aims to provide policy makers with better information on the pros and cons of managed retreat. Congress established the National Flood Insurance Program (NFIP) in 1968 to reduce flood damages nationwide and ease the federal government’s financial burden for providing disaster recovery. To achieve this goal, the program was designed to perform three primary functions: (1) provide federally backed insurance to property owners and renters; (2) establish minimum requirements for building, land use, and floodplain management practices that local communities must adopt in order for their residents to be eligible to purchase NFIP insurance coverage; and (3) map high flood-risk areas that inform local land use decisions as well as the pricing of flood insurance premiums. Theoretically, the NFIP should have deterred development in flood-prone areas, ensured that any new development in the floodplain was designed to minimize the risk of flood damage, and reduced federal expenditures on disaster recovery costs. In practice, the rising debts of the program and growing severity and frequency of flood disasters imply the opposite is true. One significant factor contributing to this shortcoming is that the NFIP is predicated on the assumption that flood risks are static and change little over time. Climate change is proving that assumption to be extremely dangerous and costly. This Comment assesses the current state of the NFIP and the threats to it from climate change. In addition, it explores several strategies to change the NFIP for a changing climate. Due largely to recent flood disasters, the National Flood Insurance Program (NFIP) is over $20.5 billion in debt. A proportionally small number of properties insured through the program, known as “severe repetitive loss” (SRL) properties, are repeatedly flooded, repaired, and rebuilt. These properties contribute disproportionally to the rising debts of the NFIP program. Climate change impacts, including sea level rise, more intense and frequent precipitation events, and increased storm surge, put these already vulnerable properties at even greater risk and will greatly increase the number of properties caught in this cycle of “flood-rebuild-repeat.” The NFIP contains an adaptive mechanism—the substantial improvement/damage (“SI/SD”) standard—which can break the cycle of “flood-rebuild-repeat.” The SI/SD standard requires property owners in the program who are making significant improvements or repairs to structures in areas most vulnerable to flooding to take certain measures to mitigate their risk. However, two critical shortcomings of the current FEMA SI/SD definition undermine the effectiveness of program: 1) the SI/SD standard is only triggered when damages or repair work are equal to or exceed 50 percent of the fair market value of the structure, and 2) the regulatory definitions of “substantial improvement” and “substantial damage” do not consider repetitive cumulative repair work or cumulative damage over time. This paper explains how reforming the SI/SD standard to calculate damages cumulatively over time and to be triggered for damages and repair work worth less than 50 percent of the fair market value of the structure can help the NFIP program better weather a changing climate, lessen the taxpayer burden, and increase the safety of homeowners. It analyzes the prevalence of heightened SI/SD standards among NFIP communities and in state model ordinances and discusses the benefits and challenges of implementing more rigorous SI/SD standards. The laws that try to reduce climate change are well known. But what about the climate change that is occurring regardless of these efforts? The Law of Adaptation to Climate Change takes a sweeping look at the current and proposed legal aspects of coping with climate change—from drought, extreme precipitation, heat waves, and wild fires to global shifts in temperature, sea level, water and food supply, coastal conditions, infrastructure, ecosystems, and human health and economies. Applicable laws exist at all levels, but are uncoordinated and embody numerous contradictions and inevitable gaps. This book provides a comprehensive resource of laws aimed at increasing resilience and reducing vulnerability to climate change. Written by authorities from private practice, government, and academia, this compendium examines the legal aspects of coping with climate change, both in the United States and around the world. Chapters address critical U.S. concerns related to water, energy, building and infrastructure, public lands, coastal issues, species and ecosystem impacts, and disaster preparedness, as well as important international issues such as financing, health, population displacement, maritime jurisdiction, water, and human security. In St. Bernard Parish Government v. United States, Louisiana property owners argued that the U.S. government was liable under takings law for flood damage to their properties caused by Hurricane Katrina and other hurricanes. The U.S. Court of Appeals for the Federal Circuit disagreed, however, noting that the government cannot be liable on a takings theory for inaction, and that the government action was not shown to have been the cause of the flooding. On September 6, 2018, the Environmental Law Institute hosted an expert panel to explore this ruling and its potential implications for future litigation in a world of changing climate, extreme weather, and uncertain liability. This paper, reprinted with permission from ELR®, presents a transcript of the discussion, which has been edited for style, clarity, and space considerations. New York’s Department of Environmental Protection is under pressure to install large amounts of green infrastructure in order to take pressure off of the city’s combined sewer system, which currently discharges raw sewage into adjacent water bodies during periods of moderate to severe precipitation. Installing enough green infrastructure to make a difference to that end (and others) means encouraging a large number of private property owners to install rain gardens and green roofs. Efforts to do that to date have fallen short. This paper discusses the city’s goals for green infrastructure (and reasons for wanting it), the challenges facing efforts to spend public money on assets installed on private property, and possible sources of solutions. This working paper reviews three recent developments, which relate primarily to comprehensive planning in Florida, and explores their implications for Florida’s local governments, among others. It begins with the State’s decision, in 2011 legislation, to give local governments a new, optional tool – referred to as “Adaptation Action Areas” (AAAs) – to address sea-level rise and related issues in local comprehensive plans. The paper then turns to a second piece of Florida legislation, this one enacted in 2015, which also identifies sea-level rise as a concern but this time mandates that local governments begin to address it and other causes of flood-related risks through their comprehensive planning process. Finally, the paper discusses a third initiative, launched in 2009 by four Southeast Florida counties – Miami-Dade, Broward, Palm Beach, and Monroe – to foster local government and regional coordination on sea-level rise and other climate change issues. This review of these three developments provides a relatively in-depth starting point for understanding key features of the emerging legal and institutional landscape in Florida for addressing sea-level rise, especially with respect to comprehensive planning. It thereby contributes to filling an enormous knowledge deficit concerning adaptation initiatives. The Department of Housing and Urban Development (HUD)’s community development block grant disaster recovery program (CDBG-DR) can better and more clearly incorporate climate resilience and adaptation priorities. This article identifies and analyzes the statutes that have guided HUD’s approach to disaster recovery to date, as well as forms of “soft guidance” issued by HUD for use by various stakeholders, including both HUD CDBG-DR program officers and the state and local officials that interact with them. Comparing these materials reveals a tension between the requirement that all projects funded by CDBG-DR “tie back” to the most recent disaster, and the logic of resilience, which holds that one should always build or rebuild with an eye to the next disaster. The article notes some signs that HUD is working to reconcile this tension and suggests ways for HUD to carry potential forms of reconciliation forward into future disaster recovery contexts. As governments turn a blind eye to the accumulating risks of climate change, do they expose themselves to potential legal liability? This paper explores three possible legal claims against state and local governments for their failure to prepare for climate change. Specifically, the paper addresses potential claims sounding in negligence, fraud, and takings, describing the benefits and challenges of each theory. The paper explores ways to overcome a government’s claim of sovereign immunity in the context of a negligence claim, noting in particular the common government waiver of immunity for claims arising out of dangerous conditions of government owned property. The paper describes the challenges of bringing a claim for fraud where officials intentionally obscure relevant information about climate change risks, including the sovereign immunity defense as well as difficulties proving causation and intent in this context. Finally, the paper explores claims for just compensation where a government causes property to be damaged or destroyed through its failure to prevent the impacts of climate change, and concludes that this type of suit is the most promising of the three. This white paper takes an up-close look at the impacts of extreme heat events on the electricity generation, transmission and distribution system and makes a series of recommendations for adaptive responses that can help states and localities avoid blackouts and brownouts and the risks to public health, public safety and local economies they pose. The recommendations include sweeping technological fixes and grid modernization, behavioral changes by utilities and end users alike, and managing the complexity of a multi-scalar, multi-sectoral problem through transparency and communication. The paper also provides comparative case studies of heat waves and adaptation responses in France, California, New York City and Australia.